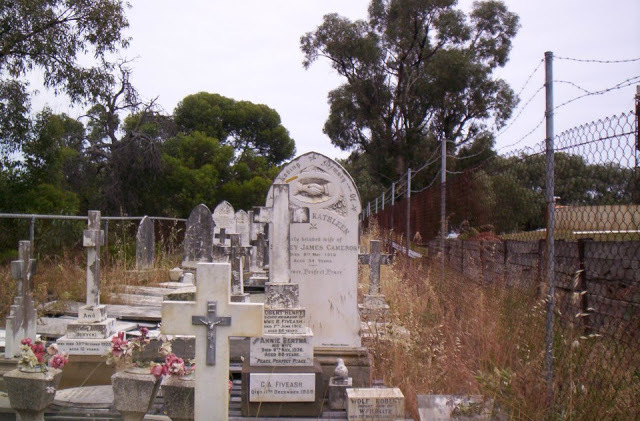 This entry was posted in Cemeteries, Graves, Memoriums and tagged Destruction of Memorials, Family History, Honouring of Auncestors, Karrakatta Cemetery, Protecting Gravesites, Western Australian Cemeteries by Catherine. Bookmark the permalink. A great post, but dreadful news of the destruction of the gravestones. Oh, it is indeed Julie. However we’re calling out for people all across the world to sign the petition and maybe they will stop it! 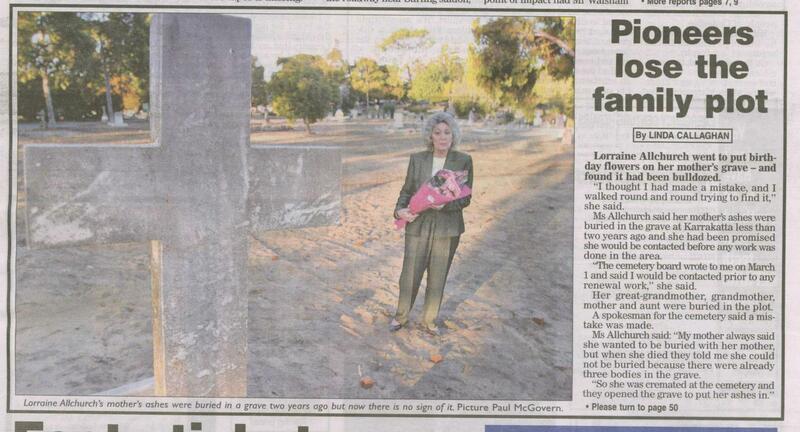 … I understand that the next Cemetery under threat is the historic Fremantle Cemetery. Just too terrible to contemplate. Thanks for caring and commenting. I have signed the petition. I am within the next week or so going to write my next article for Graveyard Rabbit – History Hare which is not technically due until July. I think that I may feature this subject. I will see if I can get it published a little earlier as there are often dates in the schedule. If you have anything in particular you want me to mention drop me a message! Thanks SO much Julie for signing the petition and how wonderful that you’re considering writing an article for “The Graveyard Rabbit – History Hare”. Brilliant! Thanks Catherine. I have posted today a press release written by Craig to my blog which is also linked to from the article that will appear at the Graveyard Rabbits hopefully this week. Fantastic Work Julie… I’m amazed and SO grateful to all who have signed the petition and passed the message on through Blogs, Facebook and Twitter. Wonderful to know that so many people care and are willing to take action. Thanks again. The wonder and brilliance of social media! You in Western Australia are having quite a rough go of it with trying to preserve your cemeteries. 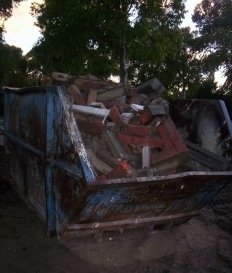 It’s sad to contemplate that they can be destroyed so easily and it really seems like a desecration to me. I signed the petition. I hope it helps! Thanks you SO very much Nancy… be assured that every signature counts and especially from people overseas whom may think that their “vote” counts for nothing. Here in Oz, it certainly does. Wonderful to get support from the USA and thanks again. Will do follow up posts as this “pans out”. Catherine, thank you for sharing this news, sad as it is… We must unite and scream from the hilltops, we cannot let this wanton destruction of memorials continue! Fellow bloggers, please help, by signing the petition and referring to all that has been written about this travesty. Thank *you* so much Chris… Oh yes, it’s imperative that people pull together and speak with one voice to get this horrific sacrilege STOPPED… and right now. I agree that the comment from Steve James, of the MCB, that the husband/ man is the “historic person” and so his grave should be retained is almost unbelievable in this day and age. I can feel my Grandmother, Mary Elizabeth (Murray, Evans) Allan, who was a very brave, courageous and hard- working woman spinning in her grave!!! The sharing of info, linking blogs, facebooking, tweeting and retweeting has been amazing. Lets all keep at it and get a surge of signatures on that petition that will make those few MCB members sit up, take notice and stop this! I remember being horrified when I read your original posts about this. Thanks for the update and information about the petition. I hope this helps to preserve your cemeteries. Yes, I remember Sheryl and many thanks for your interest and comments. This is so very much appreciated as is your signature on the petition. No doubt the MCB will not like close scrutiny, and criticism, from folks overseas…absolutely not!!! I was going to take a trip into Parliament House tomorrow/ this morning to listen to continuing debate on the new South Australian “Burial and Cremation Bill 2012” but am fearful my Blood Pressure may shoot through the roof 😦 … so better I read it in Hansard. Cheerio, for now. Yes thanks for the update Catherine, I am now off to sign the petition. I prefer the words “very passionate” rather than “obsessive” 🙂 I hope to do a quick post myself with links to yours and Crissouli’s posts. is just wonderful. Thanks for this and informing your readers of this terrible situation. Every voice counts, as does every signature on that petition. To disturb the sanctity of a person’s final “resing place” is, I believe, unconscionable. How terrible! Poor Lorraine Allchurch. Pardon me if this sounds ludicrous, but why recycle graves? Is there not enough land to bury people’s loved ones? Oh indeed, JG 😦 … Not ludicrous at all. Of course there’s HEAPS of land in Australia to bury our dead and to leave the sanctity of their gravesites intact. Thanks for caring, commenting and signing the petition. Greatly appreciated! Sadly Catherine Crout-Habel died in July 2014. She campaigned against recycling of graves in South Australia. She also wrote several times about the destruction of Headstones in Western Australia. I enjoyed reading her blog very much and am thrilled her daughter has kept it alive. Thank you Anne. I haven’t done a great job at keeping it alive lately, but I hope to find more time and focus to blog moreAppreciate your comment and re-blogging.